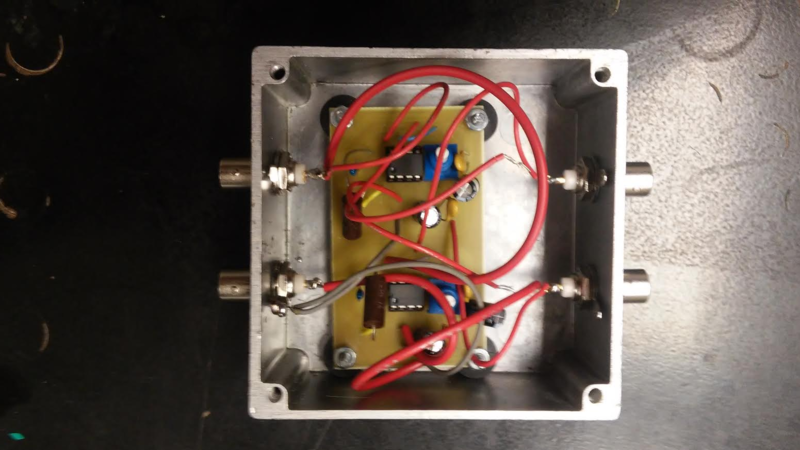 We also built another box for the High Voltage (HV) power supply (see image below, bottom right) which houses all of the live and grounding wires that connect the HV supply to other including the high voltage pulsar and the DC power supply. The circuit board of the HV supply we’re building with transistors was also redesigned (see image below) to improve reliability and ease of use as the original had the potential to create a short and had unnecessary components. At the very beginning of week 3, we measured the dimensions of the chamber again to determine a more precise requirement for the collector plate. 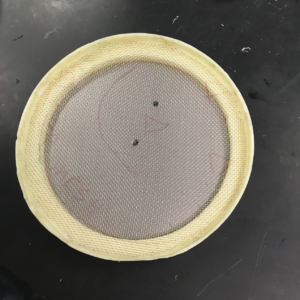 According to the requirements, that there should be enough gap between the plate and the chamber and that the mesh need to be ensured insulated to the chamber, we made some adjustment on the design of the collector plate. A 175 mm diameter metal plate was used tom replace the original 190 mm diameter plate. The plastic plate was redesigned and processed to be suitable for the new metal plate. And a plastic edge was used to insulate the mesh and the chamber. 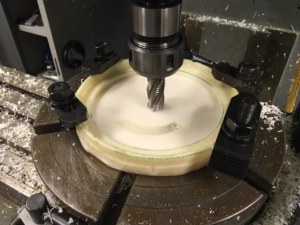 After three days of learning, trying and overcoming different difficulties, we used the drilling machine and finished the manufacture of the collector plate. The only thing missed for this part is a matching screw to fasten the metal plate, the plastic plate and the Teflon rod together. ineering Technology department. It means that the components of the injectors can be processed with high efficiency and satisfactory quality. Hopefully, the injector will be finished in next week. By then, every major parts of the experiment equipment would be finished. And we can assemble them together and test the equipment. If everything goes smoothly, we are optimistic to get the experiments started in two weeks. 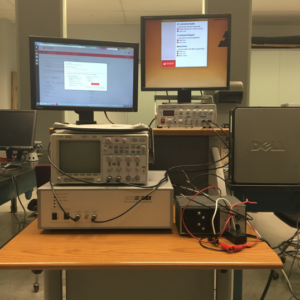 In addition, since the pulse generator, oscilloscope, function generator and the high voltage supply are already set up, we set up our work space for future experiment. In a conclusion, we achieved satisfying progress in week 3. Things are getting ready for the fully commence of the experiment. 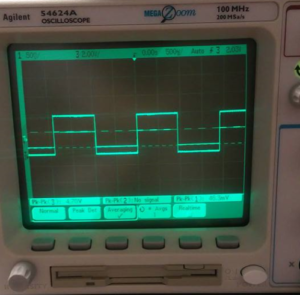 For week 3, the first iteration of the electrometer was successfully tested and completed: we used an oscilloscope to test the gain for each amplifier stage which led us to the discovery of a faulty operational-amplifier. 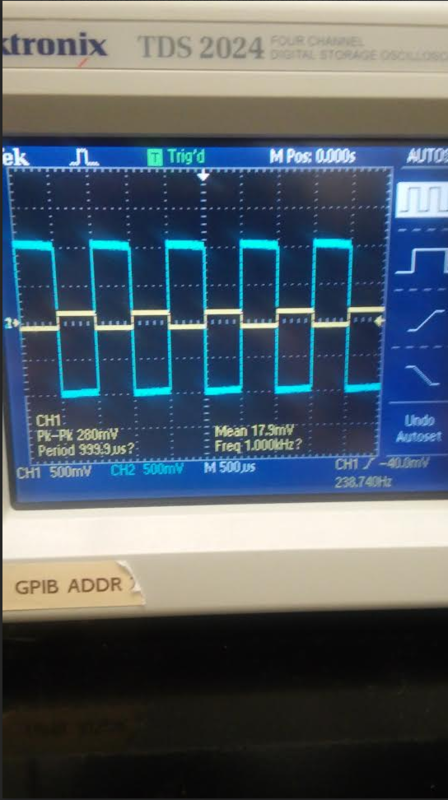 After replacing the faulty op-amp with a new one and obtaining the desired gain, we added the 220KΩ resistor to the first stage, tested again, and confirmed the desired gain result. Next we finalized the electrometer by trimming excess wire on the board’s underside and drilling 4 holes (one per corner) in which to screw on small rubber “feet” so that the board may stand evenly and securely inside the metal housing apparatus. 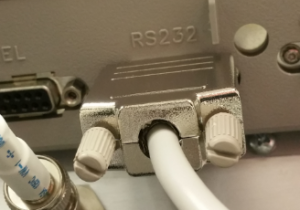 Next we hooked up our oscilloscope and computer for data acquisition and analysis: our particular oscilloscope/software requires an RS-232-C connection. 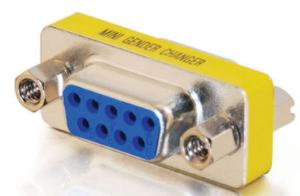 We had a DB9 Serial RS-232 cable with two male ends, but our PC port was also male (see images below for detail) so we obtained the proper adapter and hooked it up accordingly. 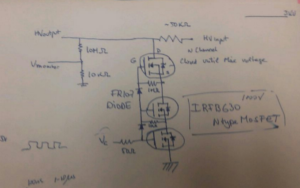 Lastly, we designed another circuit using transistors to implement our high-voltage power supply. Below are the circuit diagram and the schematic created for the circuit board using Ultiboard software. 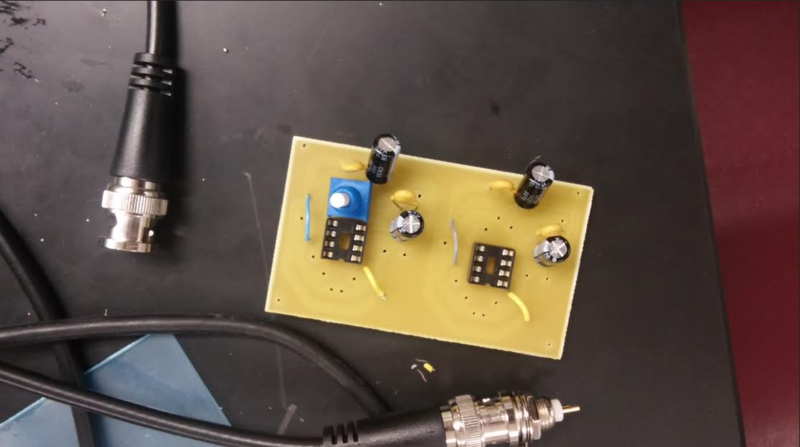 For the coming week (week 4) we will continue building and begin subsequent testing of this circuit, as well as begin coding for data acquisition / analysis. 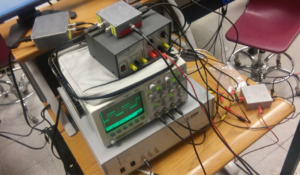 This is the blog where we show our Progress towards building a Time of Flight (ToF) chamber to measure the properties of Ion Beams for Electrical Propulsion. This was an interesting week for the team. It began with the team meeting on Wednesday June 01st, followed by regular lab work. Time of Flight Chamber. Turbo and mechanical pump attached! 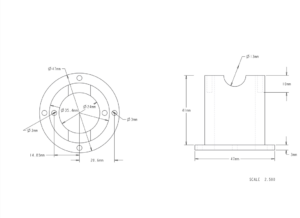 In our first meeting we were able to complete obtaining the dimensions for the diameter of the plastic casing of the collector. 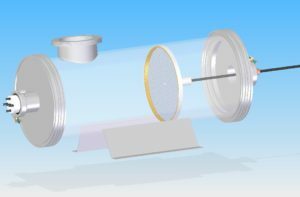 We were also able to acquire the dimensions of the collector plate, keeping in mind the angular spread of the electron beam and separation from the chamber itself. Rest of the chamber assembly went smoothly without many hurdles. 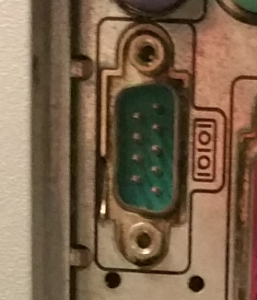 The only problem we ran into was with a missing connector part to connect the primary vacuum to the secondary one. 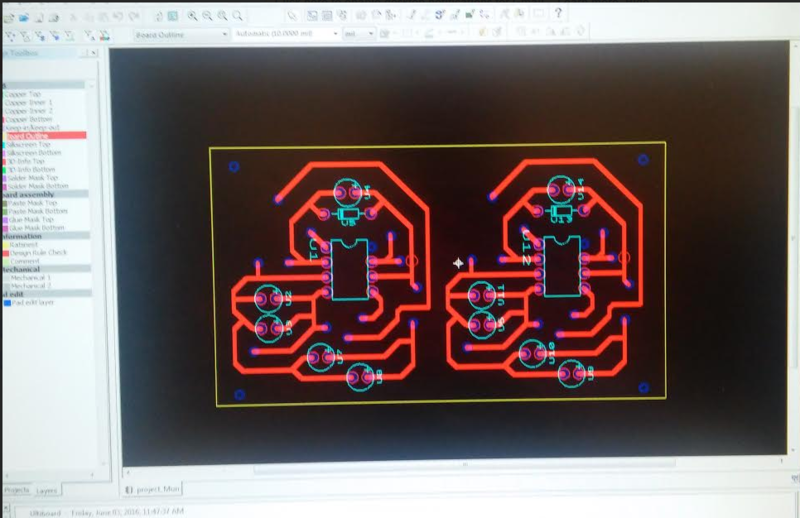 By Thursday, our second lab session, the PCB boards were designed and our primary vacuum was connected for testing purposes. 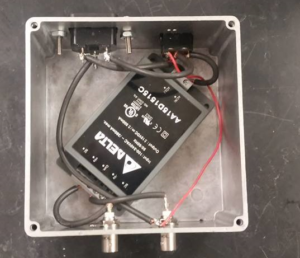 We ran into a problem when we were unable to connect our vacuum to a power supply due to its high voltage requirements and the transformer wouldn’t take that much load. Friday was a great day! 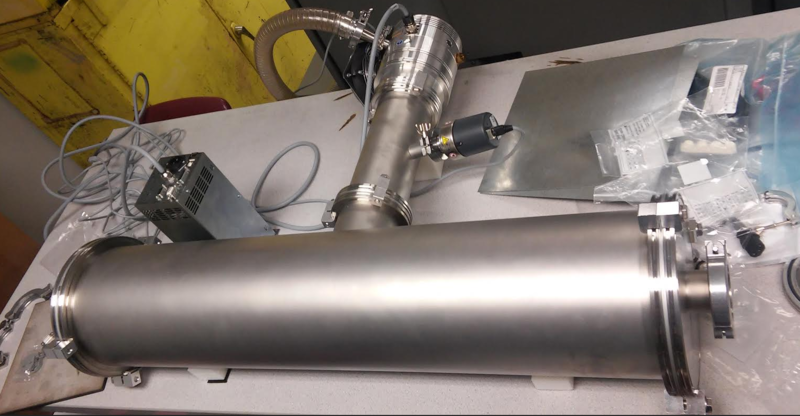 We were able to connect the missing part and have a complete test run of the chamber and vacuums. The PCB was printed by evening and we were able to understand the working of the remote control for use with the secondary pump. We were able to reach a low pressure of around 1.2E-07. We also were able to have the electrometer presentation prepared. The electrometer was built in order to measure electrical potential at extremely low values without drawing any current from the circuit. In order to make the electrometer, a layout was needed to be placed on a printed circuit board. 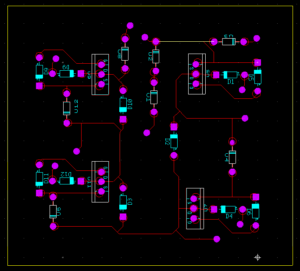 We used Ultiboard to design the circuit diagram as shown above. 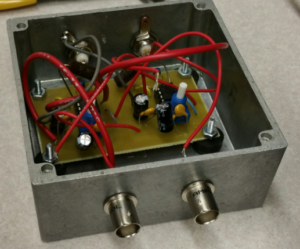 Electrometer assembled and put into the box. Ready to test it! 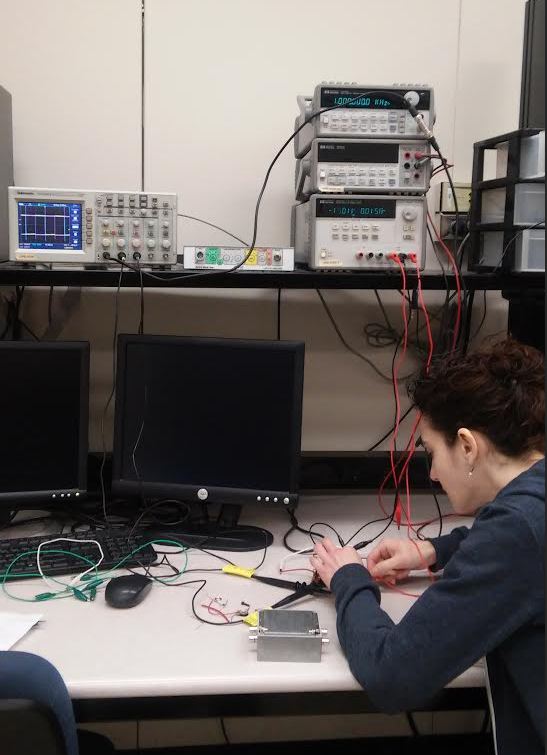 Bree is testing the electrometer and making sure that everything is properly working.